During much of the 1930s, PC Eddie Ginn was the man at 1 Forge Square – “Old Ginn” as his neighbours at No 2 – Harry and Jack Lucas – remembered him. They certainly hadn’t forgotten that he used to grow his own tobacco on the allotments, hanging it up by the Forge to dry before rolling it into large cigars. 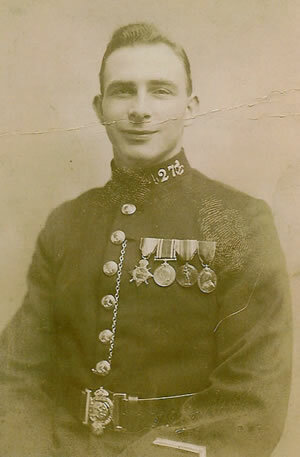 The stout tradition of a clip round the ear was not over yet when PC George Cornelius arrived in about 1937. But soon he was to have more to worry about than apple scrumpers. Soon it would be time to Put That Light Out and listen for the drone of engines in the sky. George Cornelius was Leigh’s village policeman from about 1937 to 1948 – living, like his predecessors, at 1 Forge Square . 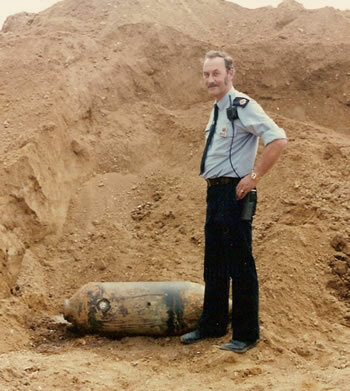 PC Cornelius knew all about the horrors of war. He had been gassed in the trenches during the 1914-18 war and faced the dramas of the 1939-45 conflict with the villagers of Leigh. “There wasn’t much crime in Leigh. I don’t remember father even having to deal with drunken fights. All the men drank, of course, and most people had their own particular pub – The Fleur, The Bat or The Brickmakers. They were like little clubs and I seem to remember that father usually went to The Fleur. Kathleen remembered that “a nice man called Bob Baker – he was called ‘Snowy’ because of his white hair – got a medal for putting out a nasty fire at a house caused by an incendiary bomb. A string of bombs had landed right across the Green and up Green View Avenue . In 1948, he retired, working for a time at Chiddingstone Brickette Fireplaces, before returning to Deal where he had started his police career in the 1920s. Following him were the two officers who were to be the last of the village’s policemen – PC “Steve” Stevens and PC Brian Woollett. It was PC Stevens who finally said goodbye to I Forge Square and moved into the newly built Police House in Green Lane in the early 1950s. Mrs Stevens, who was born June Whitbread in Barnetts Road , met Steve in Frant when she was 15. Later, when she was nursing at the Kent and Sussex hospital, they decided to get married. A police inspector friend of Steve’s family persuaded him that the police would be a good career and included free housing in those post-war austerity days when accommodation was scarce. While they waited for PC Cornelius to find a home and move out of 1 Forge Square , they lived with June’s grandmother at the Powder Mills. But the long police link with Forge Square was coming to an end. In the early 1950s, the Stevens moved into the newly built police house in The Green Lane. His beat included Charcott and the Powder Mills. There were more dark memories of her husband’s duties – searching for the body of a young boy drowned while fishing near Ensfield Bridge ; breaking the news that the son of a village family had been killed on a motor cycle on Chris tmas Day. 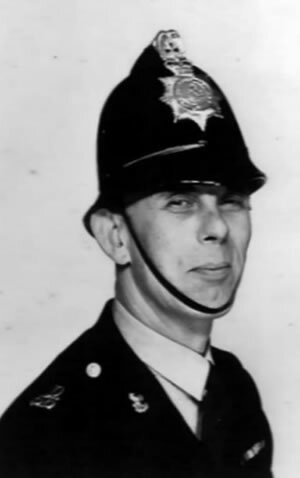 The policeman who patrolled Leigh longer than any other in the twentieth century was also one of the most recent – PC Brian Woollett – who came to the village in 1968 and still lives here. To begin with, PC Woollett mainly patrolled at night around a wide area, including Leigh, Edenbridge, Speldhurst, Southborough and Langton. One of his most frequent jobs was rounding up boys who had absconded from Swaylands, Knotley Hall or Hever Warren. “What would usually happen was that a master would take ten of them or so on a nice walk and find two of them had disappeared. So he’d send the other eight off to find them and then he’s have ten absconders! We usually found them all – and it was good for our crime clear-up figures!